The developers' renderings include brick facades and a public plaza, but a building prized by preservationists would be removed. Developers of a historic Portland property unveiled new images of their plan Wednesday, including original brick facades, new office space and a waterfront plaza. But missing from the renderings was an industrial building that preservationists say needs to stay. The former railroad equipment manufacturer’s erecting shop sits at the entrance to the Portland Co. complex and is among the eight buildings that the city’s Historic Preservation Board is recommending for preservation. In the drawings, however, the shop’s footprint is part of a public plaza that connects Fore Street to the Fore River. “We feel strongly that building very much defines the site,” said Hilary Bassett, executive director of Greater Portland Landmarks. The formal unveiling Wednesday and the concern about a missing building highlight the next challenge for the project as developer CPB2 heads toward a Planning Board meeting next month to review historic preservation rules. The conceptual drawings highlight three of the 16 buildings on the 10-acre site with several others in the background. Developer Jim Brady said the company has not revealed plans for the rest of the property because they will depend on the historic preservation requirements and the results of a November referendum that could limit building heights. The Historic Preservation Board, meanwhile, has recommended designating a large portion of the site as a local historic district and classifying eight of the 16 buildings as contributing to the historical significance, meaning they can’t be torn down. The Planning Board is scheduled to meet Sept. 8 to hold a public hearing on whether to designate the district as historic and to vote on a recommendation to the City Council. Meanwhile, a group called Save the Soul of Portland is fighting the development over concerns it could obscure views of the harbor. Critics of the project are hoping for passage of a November referendum that the developers say could kill the development plan. The site’s rich history has long been identified as part of its appeal, as well as a challenge for developers who want to reinvent the property. The Portland Co. began operating at the Fore Street site in 1847 and ceased operations in 1982. The more than 600 locomotives built there were used by railroads throughout Maine and eastern Canada, as well as companies such as the Northern Pacific Railroad and the Panama Railroad. Marine engines for hundreds of ships built in Maine shipyards, as well as navigation buoys and lighthouse components, also were produced at the site. CPB2 purchased 58 Fore St. in 2013 and has moved deliberately, revealing conceptual plans but few details about the components of the project. In June, the City Council approved new zoning for redevelopment of the site that allows residential buildings, offices and a marketplace often described by the developer as similar to Boston’s Faneuil Hall. While the developers have said they plan to preserve some of the historic buildings and will improve public access to the waterfront, they have said less-historic buildings or dilapidated structures would be replaced. 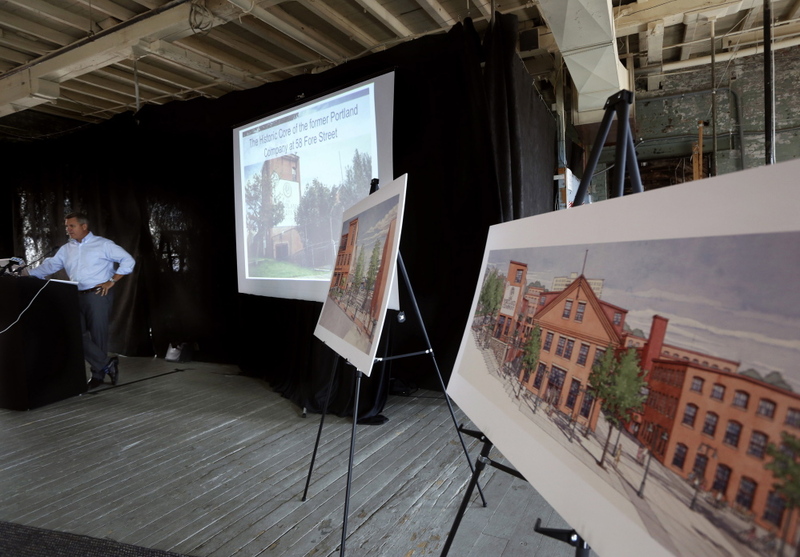 During the Historic Preservation Board process, the company opposed classifying two of the buildings as contributing to the historic significance, including the one missing from the pictures unveiled Wednesday. A spokeswoman for the company didn’t respond Wednesday for a request for comment on the preservation board’s recommendation or what it planned to ask of the Planning Board next month. At a news conference Wednesday held in building No. 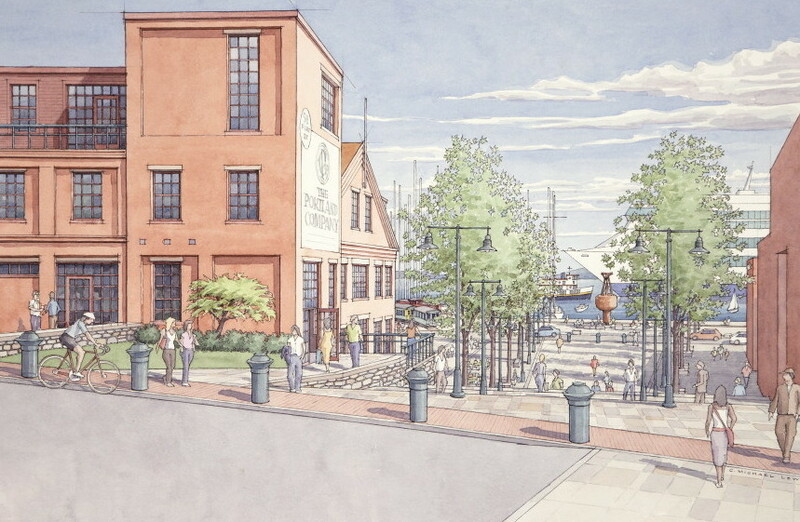 2, a former machine shop that the developer plans to preserve, Brady pointed out the public access to the waterfront envisioned in the drawings, which showed steps going down from Fore Street into a plaza that extends to the water. He said the buildings would likely contain housing and offices. Retail development would be concentrated on the western end of the site, closer to the Old Port, and, if allowed, hundreds of residential units could be built on the eastern end of the site, near existing housing on Munjoy Hill. Save the Soul of Portland released a statement Wednesday after the plans were unveiled, saying it welcomed the additional details, but would have liked to have seen plans for the entire site, including traffic patterns, as part of the rezoning application – something that would be required of future projects if the referendum passes. Question 2 on the city’s November ballot will ask voters if they want to enact an ordinance that effectively would restrict building heights on the property to protect views from Fore Street and Munjoy Hill. Those buildings are not shown on the images released Wednesday. Last week, a group called Portland’s Future announced a campaign to defeat Question 2, which it argued has implications far more sweeping than the future of the Portland Co. complex. The developers of the Portland Co. complex said they have not yet contributed to Portland’s Future, but intend to do so.